Robert McCrum’s 100 Best Novels (in English) was following a well-trodden, predictable road until it took an unexpected turning in 1818 to Nightmare Abbey. Having greeted previous entries with the smug nod of a man who has clearly encountered that particular classic in his well-spent youth, here was a novel whose acquaintance I had never made. I would probably have done nothing about it – but it turned out I also hadn’t read his next choice (more forgivable for being American), or his next… As on any journey the unplanned detours can be the most interesting, perhaps I was missing out on these B roads (so I thought) down which I had never ventured. So, taking advantage of the fact that, in this electronic age, such classics can be freely acquired, I decided to risk a couple of hours with Thomas Love Peacock. As far as I can ascertain, Thomas Love Peacock was not a pseudonym, perhaps explaining to some extent the ridiculous names the author would go on to give his characters. The main character of Nightmare Abbey, Scythrop, may seem to have escaped this fate but that is only because a passing knowledge of ancient Greek (or recourse to Wikipedia) is needed to understand that particular joke. Many other characters, however, rejoice in such titles as Mr Glowry, Mr Toobad, Mr Larynx and Mr Listless. Characterisation is not Peacock’s strength, then, and before you rush to the conclusion that his great skill lies in plot and, as its title suggests, this is some kind of Gothic potboiler, it would also be fair to say that nothing much happens. There is a love triangle of sorts, with Scythrop falling for both the flirty Marionetta, who, despite returning his love, can’t help playing hard to get whenever they meet, and the mysterious Stella, whom he shelters in the hidden chamber he has had constructed in his tower just in case a passing mysterious woman might need sheltering. All the male characters seem determined to be morbidly unhappy, an unsubtle dig at Romantic sensibility. This is only amusing if you transfer your sense of humour to the time period in question. It’s probably funnier still if you know everyone involved – as Peacock did (Scythrop is a satirical portrait of his friend Shelley). The fact that he was essentially mocking his own social circle, however, prevents the satire being biting in the way that Alexander Pope, despite similar problems with his targets, can be. Peacock’s great stylistic tick was to have sections of his novels written out as dramatic conversations. I’m sure they are a clever technique designed to allow focus on the philosophical ideas he was also interested in, but they struck me as the last resort of a writer exhausted by the effort of his own overwrought prose – writing funny at length is a lot harder than writing serious. McCrum does describe Peacock as “a personal favourite.” He has not become mine – but then that would also apply to the peculiarly English writers like Jerome K Jerome and P G Wodehouse whom McCrum compares him to. 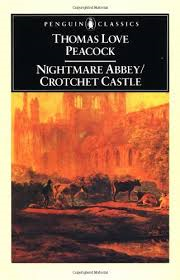 I think I could say with some conviction, Nightmare Abbey is not one of the 100 Best Novels in English (or even from England), but that does not mean I am not glad I have read it. You are currently browsing the archives for the Thomas Love Peacock category.